Superman, with Lois and Jon in the submersible pod, arrive on the dark side of the moon. Batman it seems has a secret Batcave there that Clark discovered by turning the tables and monitoring the dark detective. It provides a perfect battleground, away from prying eyes and innocent people, with the added benefit that it has enough tech to help protect Lois and Jon. Jon asks why they don't involve the League and Clark states it is a family affair, plus he's still nervous about Jon stepping out of the protective shadows. Lois looks at her son and disagrees, the more they overprotect him the more they do him a disservice as parents, he needs not only Clark Smith, but Superman to lead the way. At this moment Eradicator arrives having reacquired the souls of the Kryptonians. Superman and the android exchange blows that crumble parts of the Batcave until Eradicator decides to do as he did to Krypto and assimilate Clark with his vacuum breath. Jon fights back and demands the release of his father while Eradicator slaps Lois and begins pursuit of the boy. Again it offers to assimilate Jon's Kryptonian side and eradicate his human one, even showing a level of sympathy that he was born with a defect he had no control over. Lois seeing her child in danger picks herself up and searches through Batman's weaponry. 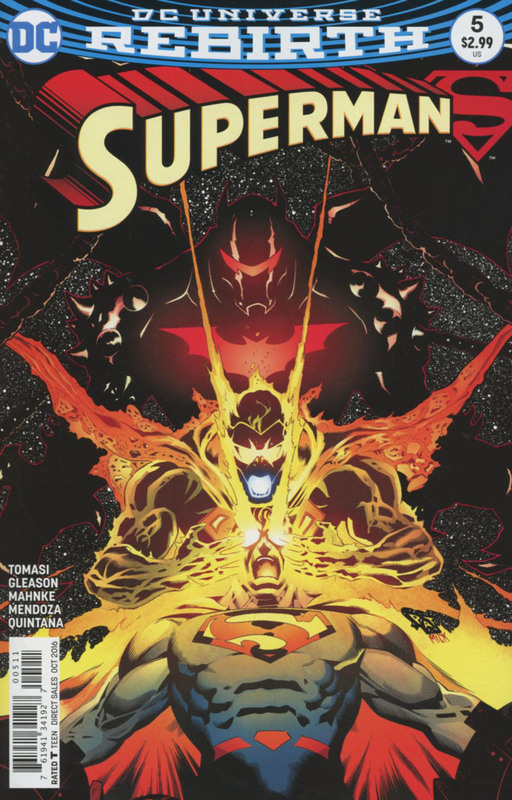 Just as Eradicator catches Jon and is about to kill him Lois jumps in to defend her son inside Bruce's Hellbat armor. The armor enables Lois to go to toe to toe in a fight with the android while Jon joins her on the attack. Meanwhile Clark stands in the void with all the souls trapped in Eradicator and asks them to aid him and free themselves in the process. Initially hesitant they begin to possess Clark, boosting him with supernatural energies and enabling him to leap out of the void and the Eradicator himself. Story - 5: I read a recent piece on Bleeding Cool that was not very kind to Superwoman, nor the writer/artist Phil Jimenez for the portrayal of Lois Lane... if that person is reading this I hope you read this issue because Lois not only stood up to her husband over his choices raising their son, but when Jon was staring death in the face she suited up in robotic armor to protect him. The parallels with the movie 'Aliens' scream out to me and I am guessing that the story points with Lois and Jon, even in the sub through to fighting Eradicator are deliberate and designed to evoke Ellen Ripley and Newt in the movie. This to me showed Lois at her best and showed her progression from determined reporter to mother. In space no one can hear you scream but boy did the Smiths unleash a monumental battle. Though I don't get the logic of bringing Lois and Jon with him to the base, for yet another scenic change (This could easily have taken place in LexLabs, The Block or STAR), I wont deny the pacing of the story has lost no momentum. One thing I liked about the discovery of the lunar Batcave is that it showed Clark had lost none of his investigative skills. After so many fight, flee, fight, flee, fight moments crammed into the Eradicator storyline I am about ready for it to be wrapped up. They don't have to visit anywhere else to end it once and for all. The suspense was palpable and the art really sold it to me. Cover Art - 4: I liked this cover though it spoiled a part of the story that I think was best left a surprise. It also mislead me to think it might have been the 'first' reuniting of the World's Finest. Alas this was not meant to be and as such the fact the Hellbat suit takes up the bulk of the cover is a little disappointing. Variant Cover Art - 5: Initially the variants had been ropey anatomy wise, but now Rocafort has hit his stride. Both the suit and man are looking good. 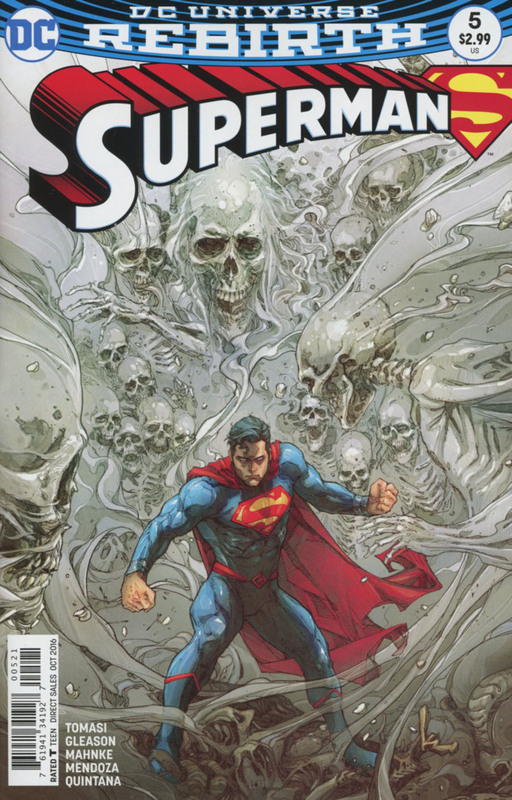 This cover looks spectacular with the ghosts of Krypton surrounding a determined Man of Steel. It surpasses the main print cover in my opinion.